Garage door openers are an often overlooked and under appreciated tool in the home that is used practically every day. If the tool is working well, then a second thought is never given to it. But if your garage door opener is not working, it can make your life miserable. Installing the right opener can provide convenience, peace of mind, and even safety. But which one is the right one for you? Believe it or not, there are dozens of different types of garage door openers on the market. Some are chain drive, screw drive, or belt drive. Others have fancy features like Wifi capabilities, backup power and even remote connectivity. All of these combinations of types and features leads to a seemingly unlimited number of options when going to purchase one. Click the buttons above for detailed information about each unit, or read on for our review of each of the top garage door openers. 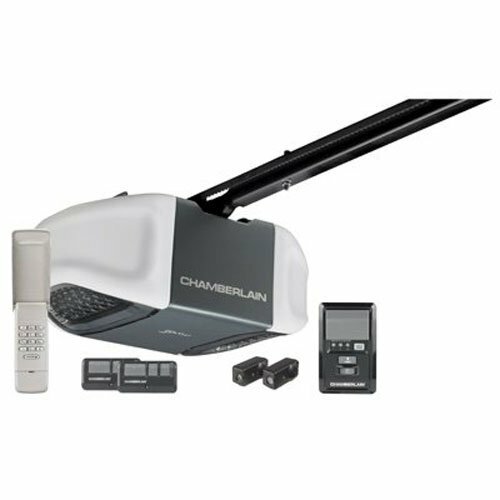 The Chamberlain C450 is a garage door opener that is long-lasting and durable. It’s equipped with smart technology to give the user the most control in managing their home. 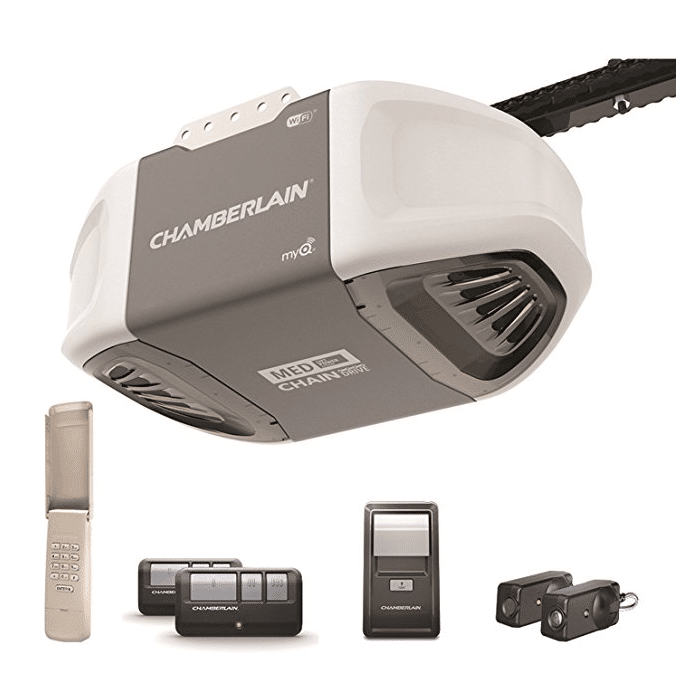 This garage door opener is powered by Chamberlain’s Lift Power System. 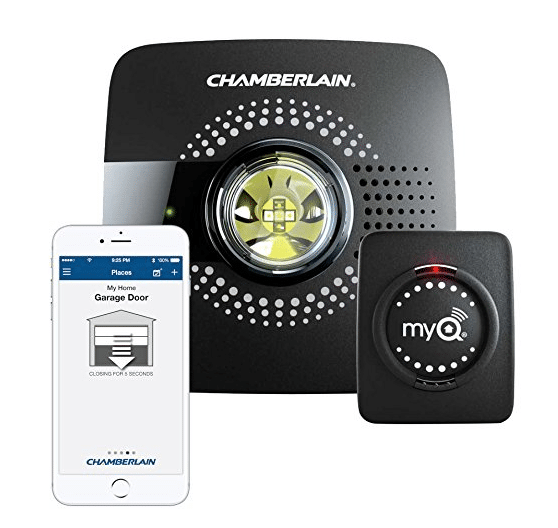 It has Wi-Fi built in so that you can control your garage door from an application on your phone called the Chamberlain MyQ App. This app lets you see real-time alerts and the status of your garage door from a smartphone or tablet. You’ll see notifications every time your garage door is closed, open, or left open. The Chamberlain C450 has been designed and engineered for security and safety. It includes a wireless keypad, enhanced TriBand technology, and a dual-function wall control panel. These features all for superior performance and range with less interference. Its security has the highest level of monitoring and encryption possible to guard against hacking. The C450 accepts two 26-watt max CFL or 100-watt max non-halogen light bulbs which are not included. It’s designed specifically for 7ft. garage doors but they have extension kits for 8 ft. and 10 ft. doors. 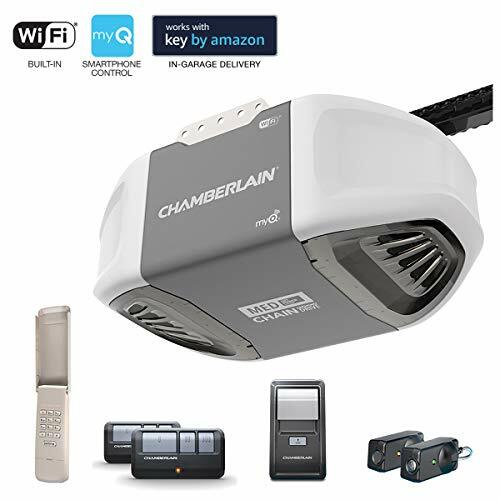 When you buy the Chamberlain C450, it comes with two 3-button remotes that can work with up to three garage door openers or accessories with the Chamberlain brand name. These garage door remotes come with a visor clip and a long-life lithium battery for your convenience. ● Encryption guards the opener from being hacked. ● The MyQ App gives you real-time notifications. ● Extra accessories come with it. ● There have been reports about issues connecting to Wi-Fi. Many of the people who have bought the C450 have given positive feedback, showing a high-level of satisfaction. It’s more moderately priced than other options. The few negative reviews it has received mention issues with connecting to Wi-Fi. Overall, it’s a great choice for those looking for a garage door opener that is reliable and high-tech. NEW! IN-GARAGE DELIVERY WITH KEY BY AMAZON: Prime members in select areas can opt-in with the C450 to get Amazon packages securely delivered right inside their garage. Simply link your myQ account in the Key App. DURABLE CHAIN DRIVE: - rugged steel construction with precision fabrication for dependable performance, use after use. 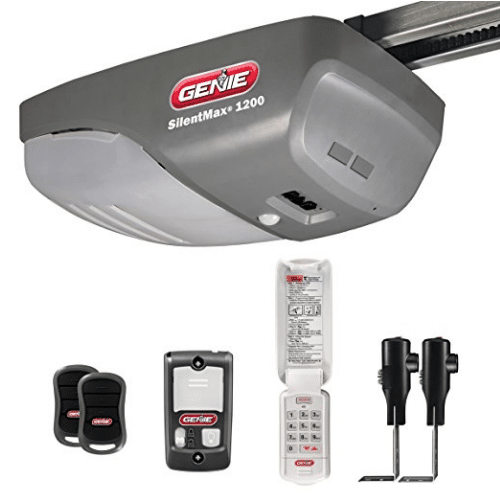 Genie SilentMax 1200 is an opener for your garage door that is a great choice if your home and garage are attached. It has a 140VDC motor. This motor makes the opener extremely quiet, smooth, and lighter. The low-volume and smooth opening is thanks to the motor’s soft-start and soft-stop feature. It’s also equipped with a steel-reinforced belt drive system. This system is durable and helps with the smooth and reliable operation. It’s designed to be used with garage doors that are 7ft. You can buy the extension kit from the brand to make it work for garage doors that are 8ft. The Genie SilentMax 1200 offers easy programming. It’s equipped with Genie’s SmartSet programming. With a just one push of a button, you can set up the opener easily and quickly. It’s meant to provide you with precise door travel control. The remote also automatically seeks out frequencies of either 315 or 390 MHz. Seeking out these frequencies help to ensure that the opener will respond despite any interference. The Genie SilentMax 1200 has its own security technology. Its Intellicode Security changes the access code on each door activation. Doing this helps to prevent any unauthorized access. The SilentMax also is equipped with measures to prevent accidents. It has Safe T-Beam, a system which uses an infrared beam that’s invisible for increased safety. The beam is placed across the garage door opening and reverses the door if someone or something crosses the beam. ● It’s really quiet thanks to the motor. ● The steel-reinforced belt ensures durability. ● Setup only takes a click of a button. ● Have to buy an extension kit for larger garage doors. Those who have bought the Genie SilentMax 1200 have had very good things to say about it. The majority of people have had a positive experience with it, but some have had complaints about the lifespan. A few people have reported it burning out within a year. Overall, it’s a great garage door opener for those looking for a secure solution. DURABLE AND RELIABLE: The steel-reinforced belt drive system adds strength, durability and value to the SilentMax 1200. SAFE AND SECURE: The Self Diagnostic Safe-T-Beam system helps prevent accidents and Intellicode Security technology helps prevent unauthorized access. 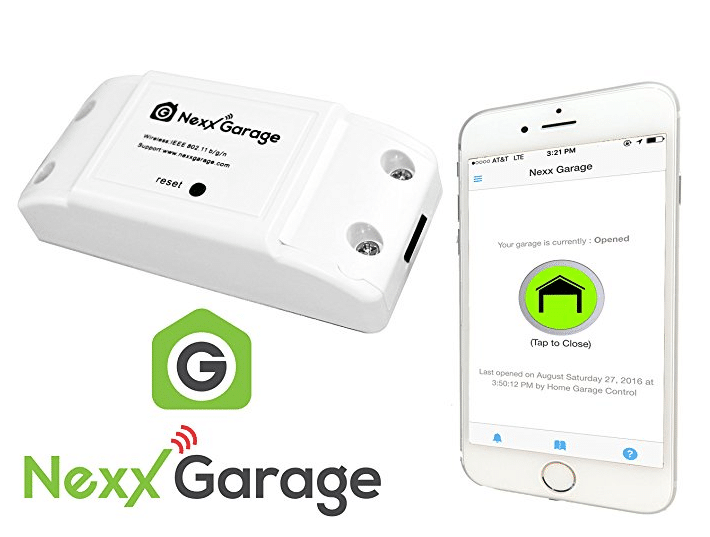 NEXX Garage’s NXG-100 is a good option for those who already own a garage-door opener. The NXG-100 is actually a companion to a door opener. It securely lets users monitor, open, and close their garage no matter where they are. To operate your garage door you can just tap a button on your smartphone. You also have the option of controlling your garage with your voice or have it automatically open using high-tech sensors. The best features that NEXX Garage is equipped with are reminders. It will remind you via your smartphone if you left the door to the garage open. You’ll also get real-time notifications concerning when your garage door was opened and who by. You also have the option of getting voice notifications. The NEXX Garage gives you the ability to share with your friends, children, parents or anyone who needs access. When they have access, they don’t need to remember an entry code or have keys. You can also see who opened your door and when it has been activated. The NEXX Garage is equipped with high-security encryption technology. This means that no one will be able to hack your garage or access your garage without your knowledge. The NXG-100 is equipped with SIMPALTEK technology. SIMPALTEK helps make smart devices simpler to use while also being affordable. They boast excellent customer service to provide the best experience to those using their equipment. They’re always there when you need them. ● You can control your garage door from a button on your phone. ● You can control your garage door with your voice. ● You get real time notification through your smartphone. ● SIMPALTEK has great customer service. ● Slightly hard to set up. The majority of people who have bought this system have had a positive experience. Some people have reported difficulty setting the NEXX Garage up, but this can be solved simply. Overall, people have had a great experience with the NEXX Garage and its affordable price. BEST IN CLASS SECURITY ENCRYPTION; reliable and secure with real-time activity logging; and only one controller per garage door opener, you can easily monitor activity. The Chamberlain WD832KEV is a strong and ultra-quiet garage opener. It’s equipped with a steel-reinforced belt and Chamberlain’s original motor vibration isolation system (or MVIS). The MVIS eliminates vibration to reduce noise which is great for any rooms situated on top of the garage. This Chamberlain model features a timer function which will close your door automatically if you forget. The system includes two remotes with three buttons, motion-detection controls, a wireless keypad, compatibility for 200-watt lights, and safety sensors. Like other Chamberlain products, the WD832KEV features MyQ technology. It gives you the capability of controlling your door via your smartphone. The MyQ technology also lets you operate house lamps and outdoor lights. You can control these things no matter where you’re at. You can get notifications about when the garage door is opened while you’re away. To get full access and home control you have to have the MyQ Internet Gateway which is sold separately. The Chamberlain WD832KEV is equipped with Protector System security sensors. These safety sensors come with Rapid-Snap brackets which projects a light beam that is invisible. It displays across the opening of the garage door. When someone or something crosses the beam, it reverses the door automatically. The WD832KEV comes with additional security and anti-burglary features. These features set up a unique code each time it is used. ● It has technology to eliminate vibration. ● It’s equipped with a timer. ● Safety features ensure that the door automatically stops. ● The MyQ App is sold separately. The majority of people who bought this product have loved it. There are a few reviews that have isolated complaints about their product, but there doesn’t seem to be a universal issue with the system. It’s a great option for those who are looking for a moderately priced garage opener that has many features. 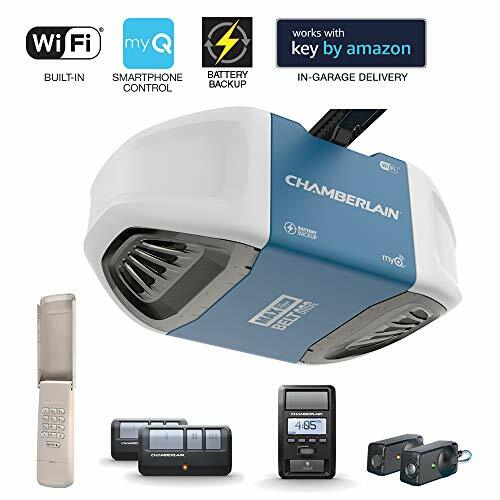 The MyQ Smart Garage-Door Opener from Chamberlain means you can control your garage opener where ever you are by syncing it with your mobile device. You can receive alerts from your smartphone regarding your garage door. 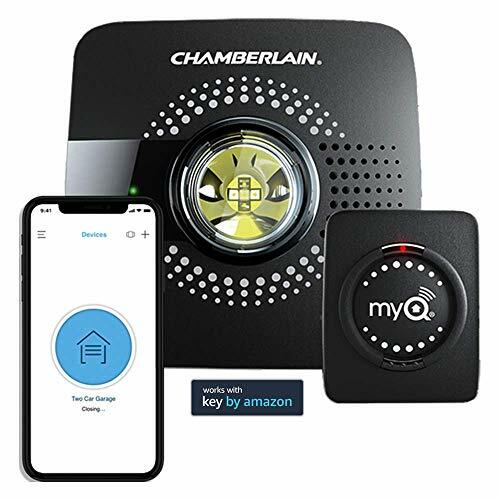 When you use your smartphone, a compatible garage-door opener, Wi-Fi, and Chamberlain’s MyQ Garage Hub all together, you are the one who is in control. The MyQ system is easy to install. To set it up, all you have to do is start by checking your Wi-Fi in your garage. Next, install the door sensor. After that, you want to power up the Wi-Fi Hub. Lastly, download the Chamberlain MyQ App. The MyQ Smart Garage-Door Opener allows you to open and shut the garage door in just a simple tap. It’s also equipped with enhanced protection and security. It has some of the best code encryption and has optional passcode and finger-print security features. Additionally, it features a scheduling option so that your garage opens and closes during specific times. You can also use this feature to turn on lights. 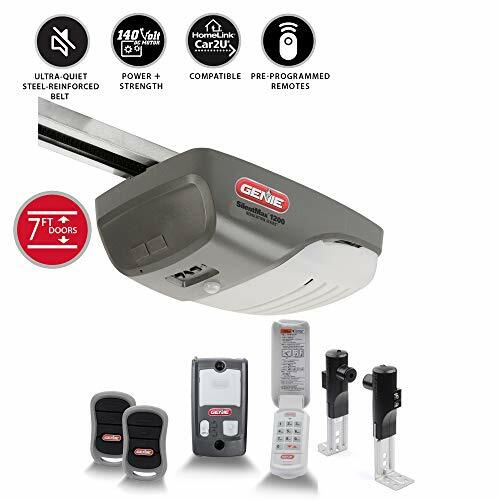 This garage-door opener ensures that intruders stay out and your possessions, data, and family stay secured. ● You can control your garage door opener from anywhere. ● Impressive security options with code encryption and a finger-print option. ● You can schedule when your garage opens and closes. ● MyQ App is sold separately. This garage door opener is moderately priced. Most of the people who have bought this product have been satisfied. One issue that people report is the cost of additional hardware that they feel make this product worth it. For most people though, the product works well for them and they are happy with their purchase. The Chamberlain B970 has been designed to bring quality, convenience, and value together. It’s a garage door opener that promises to do more than just open and close your garage door. It comes with plenty of high-tech, innovative features equipped. The first of these features is built-in smartphone control. Smartphone control makes it easier to personalize your garage and home access. Battery Backup is another feature that you can take advantage of with this garage door opener. This feature ensures that you’re never locked out of your home. These features are great for people looking for reliability and security. Additionally, you can get the Chamberlain MyQ App. With this app for your smartphone or tablet, you’ll get real-time alerts regarding the status of your garage door. You’ll get activity notifications every time your door is left open, closed, or opened. You can create schedules with the app so you can have your garage door open and shut at specific times. You have control of your garage even when you’re on-the-go. 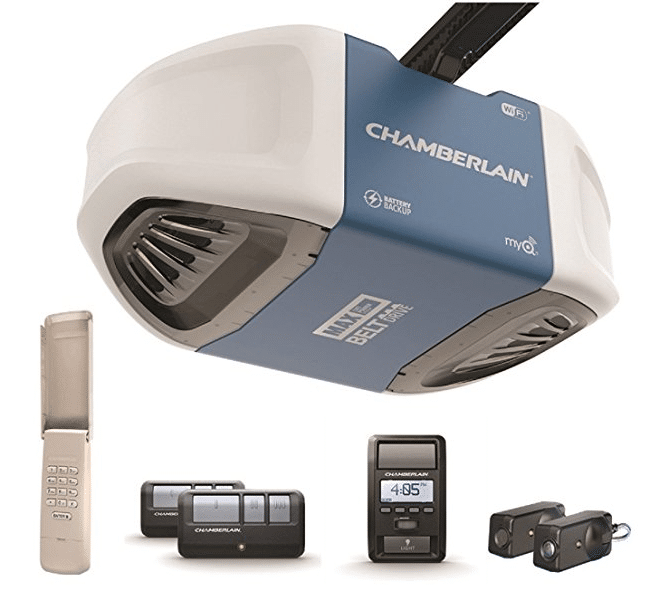 With the Chamberlain B970, you don’t have to worry about vibration shaking any room above the garage. It has anti-vibration technology which delivers smooth and quiet movement. 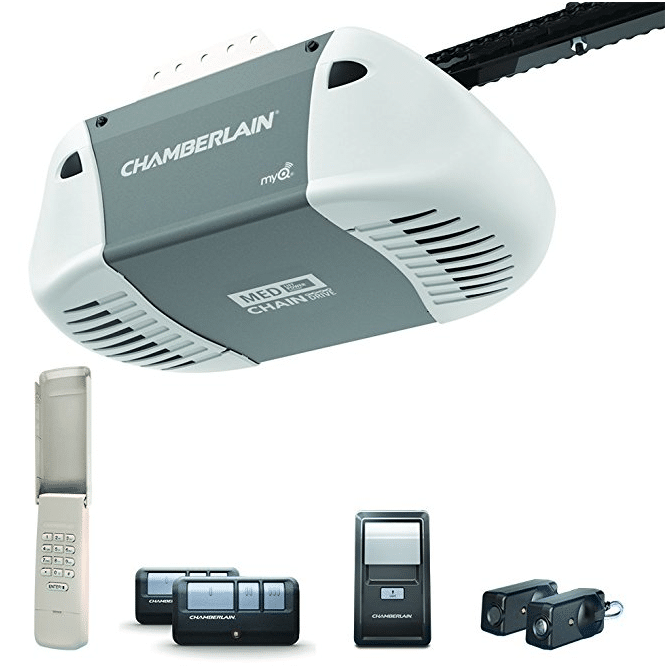 The Chamberlain Lift Power System also enables this garage door opener to lift maximum capacity. The B970 has a steel-reinforced belt that is super strong and ultra-quiet. ● Battery Backup ensures you’ll never get locked out. ● You’ll receive activity updates when you’re away from home. ● It’s equipped with anti-vibration technology. ● People have had trouble integrating the opener into their smart home systems. The majority of people who have bought the Chamberlain B970 have had a positive experience. A small number of people have reported trouble integrating the system into their smart house, but this is nothing major and can be easily sorted. Overall, it’s a great choice for those looking for a moderately-priced garage door opening system with modern features. 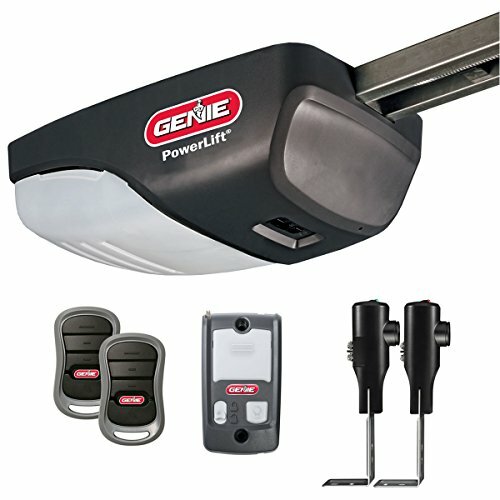 The Genie PowerLift 2562-TC is a durable garage door opener. It’s equipped with a strength that can operate residential garage doors that are heavy, lifting up to 500lbs in weight. It can also be used with doors that are 8 feet tall with an extension kit. If you have a particularly heavy door, then this is a brilliant solution for you. Plus, its direct drive technology is even more guarantee that its designed for maximum lifting force. The PowerLift garage door opener is equipped with forged steel screw drive. It incorporates a c-channel rail design which gives it a clean appearance and flush-mounting capability. This design means that it has no gears, belts, or chains that can wear down. It’s a feature that should ensure that the garage door opener will last for a long time. Installing the Genie PowerLift 2562-TC is easy. You’ll get two pre-programmed remotes that have three buttons. Since they’re preprogrammed, you can install the system faster. It also comes with a multi-function console for your wall. This console has a light control button and a vacation lock feature. ● It can lift a large amount of weight. ● It’s designed to have no chains, belts, or gears for a clean appearance. ● A few people noted that it has a “tinny” sound. 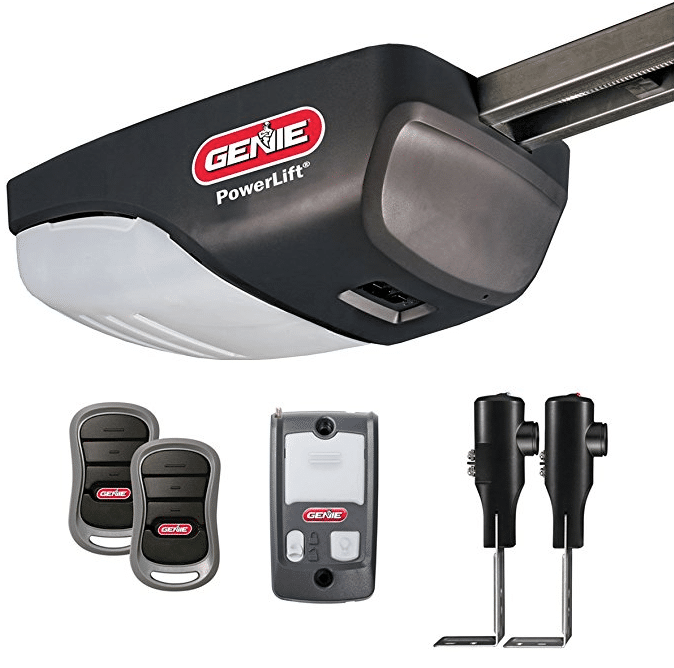 Having a garage door opener from Genie means getting a product from a long-trusted brand. They’re known for being dependable but affordable. The PowerLift is no exception. The majority of users have positive feedback, noting the ease of installation and the uniqueness of the product. Overall, this garage door opener is a good option for those looking for a model that can lift heavy-duty doors. ½ HP AC MOTOR AND SCREW DRIVE SYSTEM: Provides reliable power to operate heavy residential garage doors up to 500 lbs. TWO PRE-PROGRAMMED REMOTES WITH 3 BUTTONS: For faster, easier installation, remotes are ready to use out of the box, no additional programming is needed! WALL CONSOLE: Multi-function wall console features vacation lock and light control button for extra security. SELF-DIAGNOSTIC SAFE-T-BEAM SYSTEM: Invisible LED light reverses door if beam is crossed, keeping your family and pets safe. EASY AND FAST INSTALLATION: Low-profile, maintenance-free C-channel rail provides a clean design with no additional hardware required for assembly. 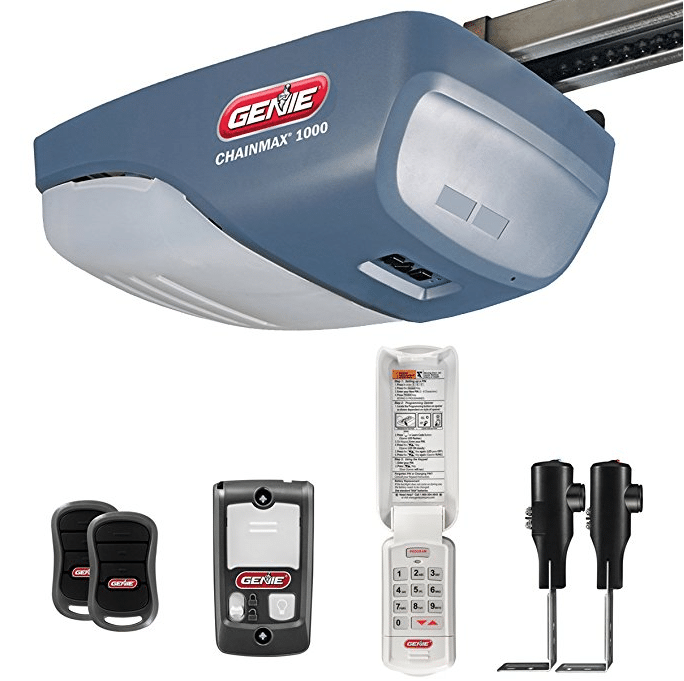 Genie’s ChainMax 1000 garage door opener is a great option for those looking for a traditional opener that’s operated by a traditional chain. It’s meant to be long-lasting, dependable, and reliable. The ChainMax is an affordable option that has the strong brand name of Genie behind it. It means that it performs quietly and is designed to work better than most others. It’s equipped with a powerful motor that runs on 140 volts, making it suitable for a standard residential garage. Other features are easy installation and smooth door travel. The ChainMax features Genie’s SmartSet programming. This programming makes it faster and easier for you to set up. In fact, you only have to push a button. It also comes with Intellicode Security. It’s security changes the access code each time the door is activated, which will help prevent any unauthorized access. It also comes with the Safe-T-Beam system by Genie that is designed to prevent accidents. It puts an infrared beam that’s invisible across the opening of the garage. When someone or something goes through the beam, it stops the movement of the door. With the garage door opener, you get multiple accessories. You get two 3-button remotes that are pre-programmed. This allows you to open the garage door from your car. It also comes with a wireless keypad that is keyless. You can use this to access your garage instead of your remote. You’ll also get the multi-function wall console, which will allow you to control the light and set up a vacation lock. ● SmartSet programming allows for easier and faster setup. ● Safe-T-Beam offers protection in case someone crosses the door threshold while it is closing. ● Has function that allows you to lock the door while on vacation. Many customers were satisfied with the ChainMax. The people who had negative remarks found that customer service wasn’t helpful. Overall, the ChainMax is a great affordable option for anyone looking for a simple, traditional garage door opener. SMOOTH OPERATION: 140-volt DC motor operates with soft start and stop control for easier installation and smoother door travel. SLEEK AND CLEAN: Premium reinforced low-profile c-channel rail protects against dirt and debris buildup with flush-mounting capability for low-headroom applications. SAFETY FOR YOUR FAMILY: Self-diagnostic Safe-T Beam system helps prevent accidents via an invisible infrared beam across the door opening that reverses the door if an object crosses the LED beam of light. ACCESSORIES INCLUDED: Includes two pre-programmed 3-button remotes, a wireless, keyless keypad and a multi-function wall console (control panel). 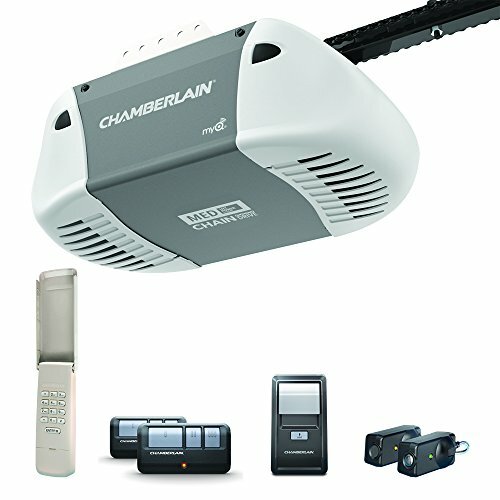 The Chamberlain C410 is a garage door opener that has proven to be reliable. It’s easy to operate as well as install. It’s equipped with high-tech and safety features that make this garage door opener really appealing. This garage door opener is intended for you to get the support you need and takes the worry away from you. The C410 is powered by the Lift Power System by Chamberlain. This means that it has a chain that is long-lasting and durable. Its highest lifting capacity is compared to the ½ power class. It’s been designed and made with security and safety in mind. It’s equipped with TriBand frequency technology, giving it great performance and range. It also features great code encryption, dual-purposed wall control, Posilock protection, and a wireless keypad that you place on the exterior of your home. The system can accept two 26-watt CFL or 100-watt max non-halogen light bulbs, which aren’t included. It’s designed specifically to work with residential garage doors that are 7 feet tall. There are extension kits available for doors that are 8 ft. and 10 ft. tall. You can get Chamberlain’s MyQ Smart Hub for your smartphone or tablet. This app will allow you to control your garage door from wherever you are. You can check the status of the door, open, and close it from this app. Unfortunately, it is sold separately. ● The chain is durable and long-lasting. ● TriBand frequency improves performance and range. ● You can control it from your smartphone or tablet. ● It’s been reported to be noisy. The majority of users gave this garage door opener rave reviews. The few that were not satisfied with it didn’t have one unified complaint about the product, which was the noise. 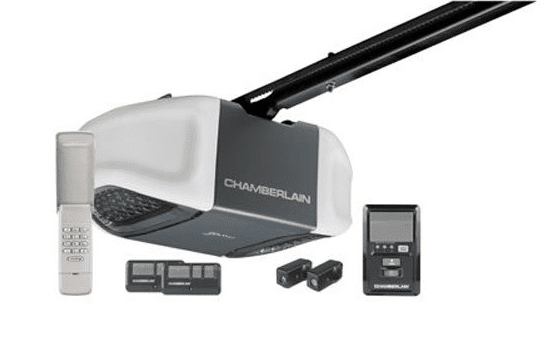 Overall, the Chamberlain C410 is a great garage door opener for those who are looking for a system that is simple and reliable. Most people have little idea about their options when it comes to finding the perfect garage door openers for their residential property. Even fewer people understand how the many different types of garage door openers work and the differences between them. With that in mind, this article aims to set the record straight and give you the lowdown on everything there is to know about garage door openers. Hopefully, by the time you reach the end of this lengthy post; you will have no doubts left in your mind about the best type of garage door openers for you. There are lots of things to consider before you make the decision, and the information below should assist you in making light work of that process. There are four primary types of garage door openers that we’re going to discuss in this section. All of the openers mentioned below have one thing in common, and that is that they all use a motor that moves a trolley. The trolley connects to the door, and when it is activated, the device makes the door move up and down at your request. However, as you will discover in just a moment, there are some differences that you will need to consider. For instance, the main thing that sets each of these garage door opener types apart is the driving utility. Some openers operate using chains whereas others use belts or alternatives. Direct drive garage door openers are some of the most straightforward devices on the market today. That is because the motor moves the trolley itself, and there is no need for belts, chains, or anything else. That means there aren’t as many parts that might break and require replacements compared to some of the other garage door openers mentioned on this page. 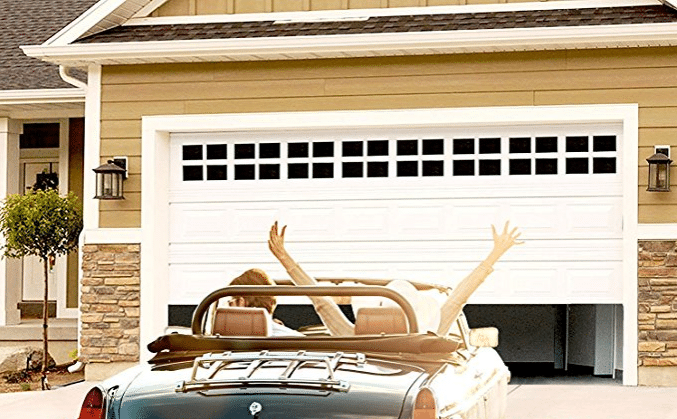 Direct drive garage door openers provide a smooth and quiet operation which makes them perfect for built-up residential areas where you don’t want to make a lot of noise as you get your car ready for work in the morning. Suitable for: Properties of any size, especially in built-up areas. Belt drive garage door openers use a belt to slide the trolley when you need the door to open or close. The motion is smooth, and there isn’t much noise because the belt is made of rubber, and so it doesn’t create too much friction. That means there aren’t any vibrations that could cause disturbances to neighbors or anyone else living in your property. As with direct drive garage door openers, this solution requires little or no maintenance for many years, and so it’s a top choice for people who enjoy a carefree and relaxing life. Belt drive garage door openers are some of the most common on the market today, and once again, they are ideal for almost every type of residential property. Suitable for: Properties in residential areas, especially those with bedrooms or living areas above the garage. Now we come to the screw drive garage door openers, and this is the first time we’re going to look at something that works in a slightly different way. Screw-driven garage door openers make use of a metal rod that deals with the movement of the trolley. The trolley then raises and lowers as the rod rotates. There aren’t many parts that might require replacements, and so there is no need to stress about the cost of regular maintenance in most instances. Compared to chain drive garage door openers, people who choose screw driven alternatives will never have to worry about creating the same level of noise or disturbance. In fact, screw drive garage door openers are almost silent when they’re functioning correctly. Suitable for: All types of houses, especially those with bedrooms adjacent to the garage space. Chain drive garage door openers are some of the most common found on the market today. Unlike the other types of garage door openers mentioned so far, this one uses a chain to move the trolley and open and close the door. When it comes to price, chain driven alternatives are usually the most affordable option, and that is why more people purchase chain-based devices than any other solution available. However, it’s important to note there are some valid reasons for the price difference. Firstly, chains can break, they need oiling, and so anyone who chooses a chain drive garage door opener will have to deal with maintenance tasks from time to time. Secondly, the chain on these devices makes a lot of noise. Suitable for: Properties with detached garages. What features should I look for when I buy a garage door opener? There are lots of standard features that you can expect to encounter when you take a look at any garage door opener on the market today. However, there are many other things that you will only find when choosing particular products, and so you might want to consider the information below before you head out to invest. Try to find a solution that includes all the features mentioned in this section, and you should manage to avoid feeling disappointed with your decision further down the line. 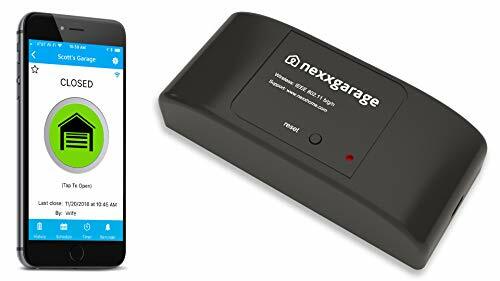 There are some garage door openers on the market today that connect to your WiFi system and enable you to control their functions from your smartphone. That is excellent because it means you can close the garage door from your desk at work if you remember you left it open as you left home. You can also open and close the door at any other time from anywhere in the world so long as you have access to a WiFi connection. Some people love that feature, and others don’t seem to see the benefits. While it’s probably not worth spending more than is necessary to get something that connects to your WiFi network, using that feature is always going to be fun and convenient. There are lots of different types of remotes that come with garage door openers these days. Ideally, you need something for which you can use a small, handheld remote that you keep in your car. You can then use the device whenever you’re ready to approach the garage upon your return home from work. However, some garage door openers also come with keychain remotes that are compact and fit on your keyring with your car keys. Those remotes are excellent because you aren’t going to lose them. As you can probably imagine, losing the remote for your garage door opener can cause lots of issues, and that brings us to the next point. Make sure you select a garage door opener that provides manual operation solutions. You need to do that because you never know when you might lose the remote or lock yourself out of the garage. Nobody wants to arrive late for work because they couldn’t gain access to their car, right? That is going to cause a lot of embarrassment at the office, and you might even get into trouble. So, before you use your bank details online or agree to the purchase from a local store, make sure you check to ensure the garage door opener you’re considering allows you to open and close the door without using the motor. Some modern garage doors come with security lights these days, and they tend to switch on and off using a motion sensor. That means the light will come on as you make your approach up the driveway. If nothing else, having an automatic light is convenient as you will never have to park in the dark or mess around attempting to find your torch. 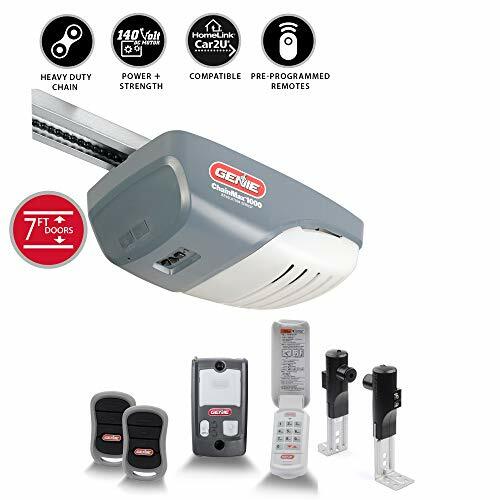 So, while you probably aren’t going to see a garage door opener on the market that comes with a security light, many people in the market for those products will also buy new doors. If you’re going to do that, make sure you get one that comes with an automatic and motion-sensor-activated light because that will benefit you on those dark evenings. There is a lot of buzz online at the moment about the benefits of home automation. There are also hundreds of new products within that niche hitting the market every single day. Within a few years, everyone will live in a smart home, and that will help to make our lives much easier than they are at the moment. With that in mind, it’s possible to find garage door openers that link to your home’s automation system and work in the same way as all the other devices that do that. So, you can let the system work out the times you are most likely to leave for work in the mornings and come home in the evenings. The doors will then open and close without the need for any human interaction. Of course, automated garage door openers can pose problems too, and so you need to weigh all the pros and cons. While there are garage door openers that link to your home automation system, there are also products out there that do the same thing without all the hassle. Auto-closing garage door openers have been around for a while, and they’re a fantastic solution for people who often forget to close the garage doors after removing their car. The devices are also perfect for those who live on busy roads. That is because it is not always possible to pull out of your garage onto the road and then get out of the car to close the garage door. Sometimes there is too much traffic, and that idea will place you in danger. So, an auto-closing garage door opener could be the answer to your prayers. What safety features should I look for when buying garage door openers? There are lots of different safety features you might like to choose when sourcing the most suitable garage door opener for your property. Some of the best ones get mentioned in this section, and so you should read this information carefully before you agree to spend your hard-earned cash. Some garage door openers come with timers and settings you can use to ensure the door remains closed and locked when you spend time away from the house. Maybe you have a vacation coming up soon, and you’re worried about someone breaking into your home through the garage or stealing your car? Well, if you use timers and settings to ensure the area is 100% secure, there is a reasonable chance you won’t have to stress so much and you can enjoy your time away with the family. The door will become deactivated, even if the criminals manage to steal your remote! Do not make the mistake of investing in a garage door opener that does not come with some form of a motion sensor. That safety tool helps to ensure the door will never close on your car if you leave it sticking halfway in and halfway out of the garage. Openers without motion sensors that have an auto-close feature could cause an incredible amount of costly damage to your vehicle, and nobody wants that to happen. There are different types of motion sensors, and some tend to perform better than others. So, be sure you conduct some research before making your final decision on the matter. Now you know the ins and outs of different types of garage door openers and how they work; you should be in the perfect position to make the right decision for your property. Remember the safety features mentioned in this post, and ensure you don’t make the mistake of buying the first garage door opener you encounter. There is no getting away from the fact that garage door openers help you to save time, but you still need to get a device that functions as you expect and stands the test of time. So, read lots of reviews before you place that order.